Lately I’ve become quite fond of “passage making” – going from point A to point B relatively directly, without overnight stops. Just like anything, the more you do it, the more you get adjusted to the process, and the various requirements. Since leaving the Connecticut River this year, I’ve now done this twice (plus a few more passages in previous years), and I’m happy to say that I’m now presently in Penobscot Bay, Maine, after a surprisingly short amount of time. After that it was off around the outside of the Cape, eventually ending up in Cohasset, which is on the south shore of Boston. Doing this trip around the outside of Cape Cod took three nights and the better part of four days, mostly because I had the idea to start with a north wind. 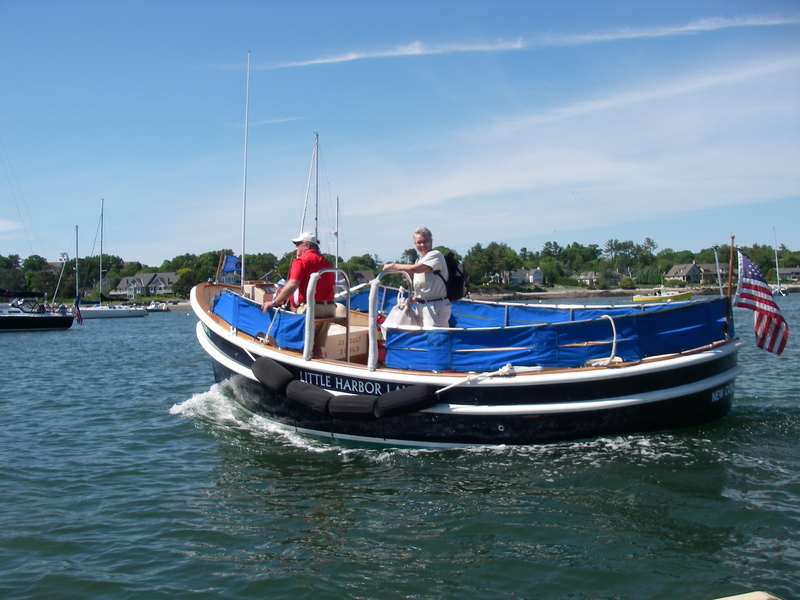 That was ideal for leaving from Cotuit, and for going east, out the channel between Cape Cod and Nantucket, but then there would be a pause, expecting little progress, while waiting for the wind shift. The idea was that the south wind due to arrive on the following day would then be good for the run north. I didn’t count on getting seasick, once outside of Nantucket sound! It was a bit of a strong wind, and there was a bit of a boisterous sea. A relatively strong wind is a good thing, especially in a tricky passage (“passage” also means a path between assorted obstacles), with shoals nearby. The last thing you want is not enough wind, and a current pushing the boat somewhere it doesn’t belong. 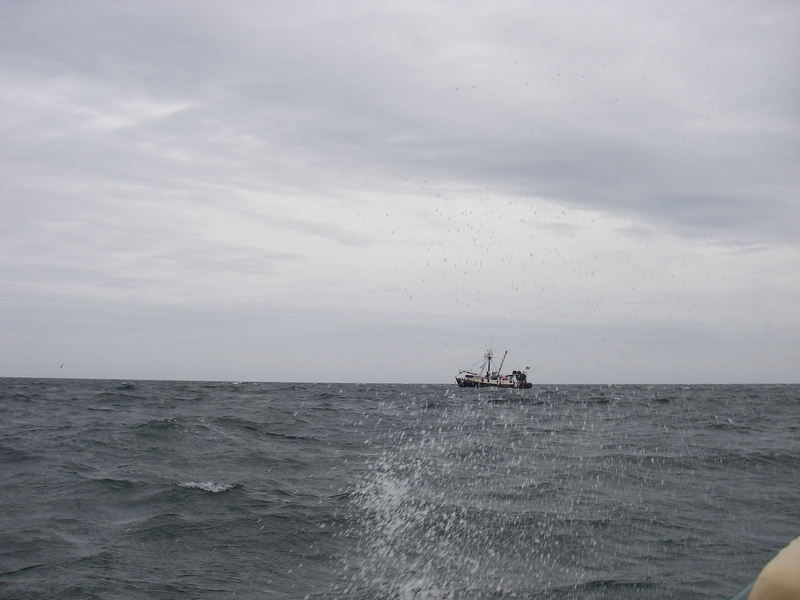 As it turned out, given the strong wind and seas, the only viable option on that first night was to go southeast, eventually about 35 miles out. This was away from Nantucket Shoals, but a little far in the wrong direction. Somehow, all that open water, with all those waves, was more disconcerting than usual, and my stomach registered deep protest. 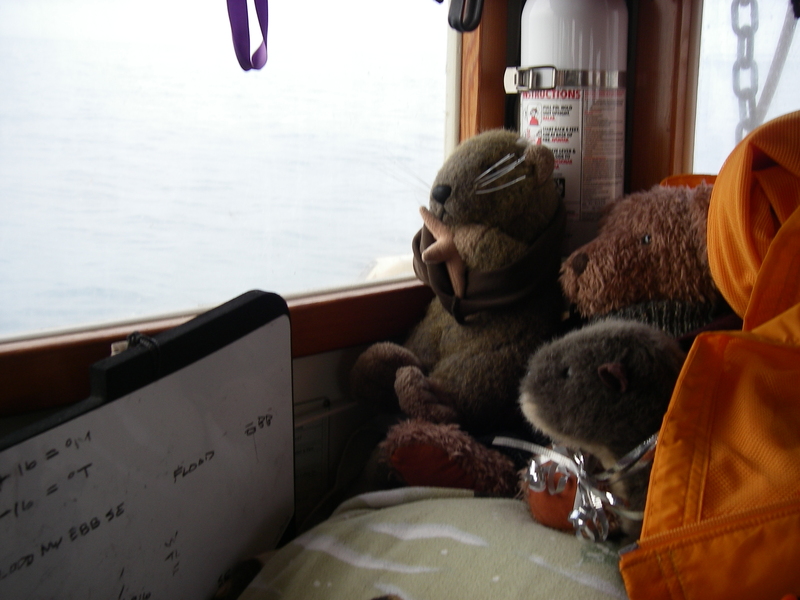 Ah well – thank goodness for homeopathic remedies for motion sickness, already on the boat, generally there for crew. And for oyster crackers, which were eventually quite sustaining. 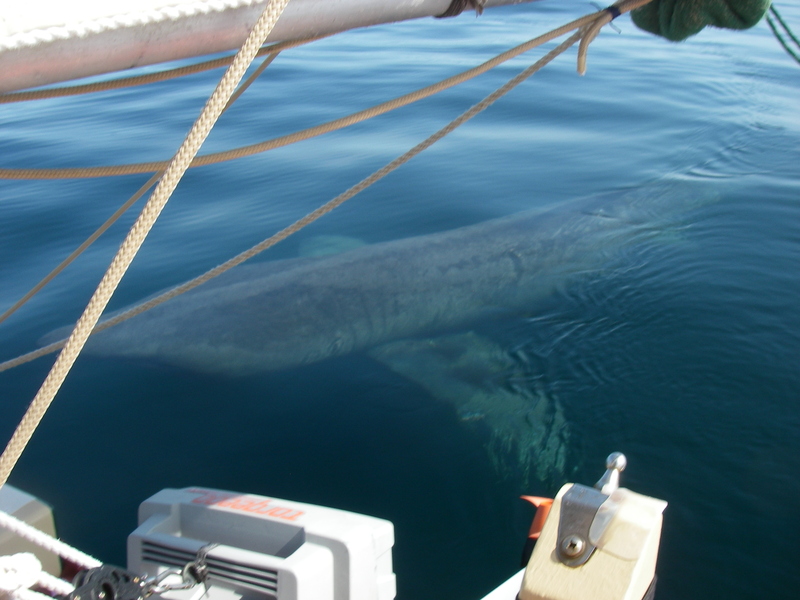 By the next morning the sea had settled down, my stomach was improving, and in that peaceful time between the end of the north wind and the beginning of the one from the south, there were whales, and porpoises, and even a close up visit from two basking sharks! These are enormous, but make their living by eating plankton, swimming slowly with no aggression whatsoever. Still, it does get one’s attention. There were thoughts of going into Provincetown, but by the time we were around the top enough to turn the corner toward the south, the wind was again rather wild, and tacking against those seas and the tide was yielding no success. Night was coming again, and the alternative, sailing slowly across the 25 miles to Cohasset, would generate plenty of time for rest, with an arrival well after it got light again in the morning. This is indeed what we did, “we” being myself, the boat, and the electronic companions. Traffic is the biggest worry, when it comes to getting rest as a solo sailor. There is the issue of rocks, and land, but those are fixed, and avoidable, with proper planning and care, and enough distance off. It’s the other boats, that can show up at any moment, that need to be constantly watched for. The electronics now on this boat are great about providing notice well in advance of almost any traffic. Ships and ferries, and high-speed whale watch boats, as well as some commercial fishing boats and some recreational vessels, show up on the AIS (for more on AIS, see this post from last year: https://sailingauklet.com/2014/01/11/ais/ ). Over this past winter we also installed a Mer Veille radar detector (more in an upcoming post). This gadget uses minimal electricity, and beeps enthusiastically whenever somebody else’s radar signal reaches its antenna. 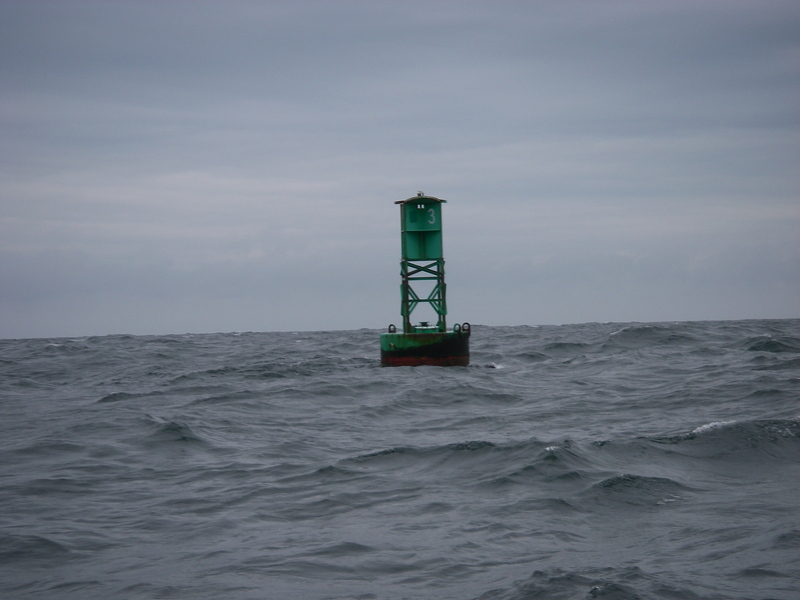 Most any other traffic on the open water, especially at night, or in low-visibility conditions, is running radar, so there is good warning if anybody is out there. 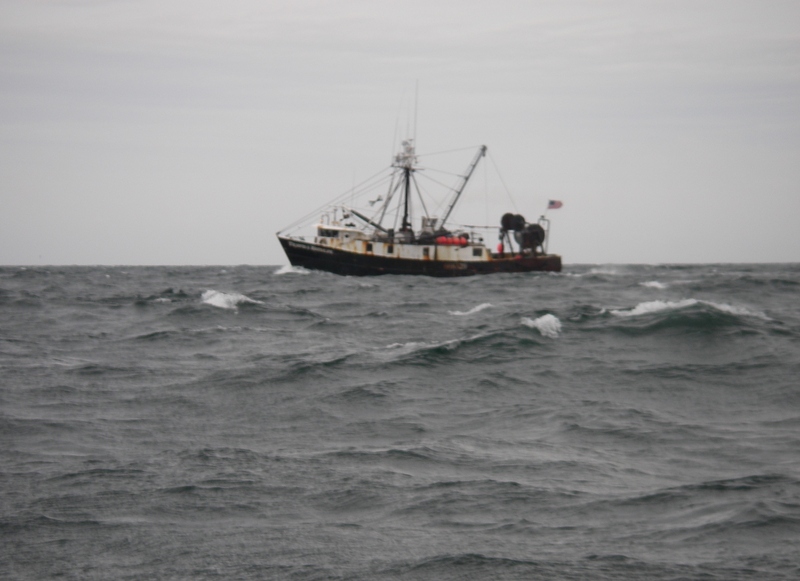 Commercial fishing vessels, particularly, are now well-announced. Between the two of these pieces of equipment, I’ve become much more comfortable with taking naps at sea. Even better, when the weather is rather lousy there’s hardly anybody out there anyway. Going across the north edge of Cape Cod Bay, the ferry to Provincetown appeared a couple of times on the AIS, passing at about 6 miles away, and that was it for the entire night. I’m sure this was aided by the forecast of 4 to 7 foot seas, which was in fact happening for the first part of the night. But the boat did well, oriented at about 50° to the wind, as if hove-to but set up to sail forward at about one knot, going gradually west. I got some rest, and then in the morning, after a somewhat false start trying to get into Scituate, ran downwind to Cohasset. The only complication was my pants trying to fall off, coming into the harbor, because I hadn’t realized just how much weight I had lost in the last few days, and neglected to do something about a belt! During those days at sea I thought, oh now I’ve probably had about enough of this passage thing. From here on, it’s harbors at night. But of course by a few days after that, and some nice rest, and reflecting on the whales and pelagic seabirds (nevermind the sharks), it all didn’t seem so bad. I started to think that if I would just choose my weather a little more conservatively, I might just like to do it again. From Cohasset it was a day’s ride across Massachusetts Bay to the islands southwest of Gloucester, and crossing Massachusetts Bay I found myself with that itch to just go out to sea. The weather wasn’t right for it, at the time, and I was due for some more rest, but it was interesting to see that that was how it felt. In the meantime, it was nice to be in the islands. 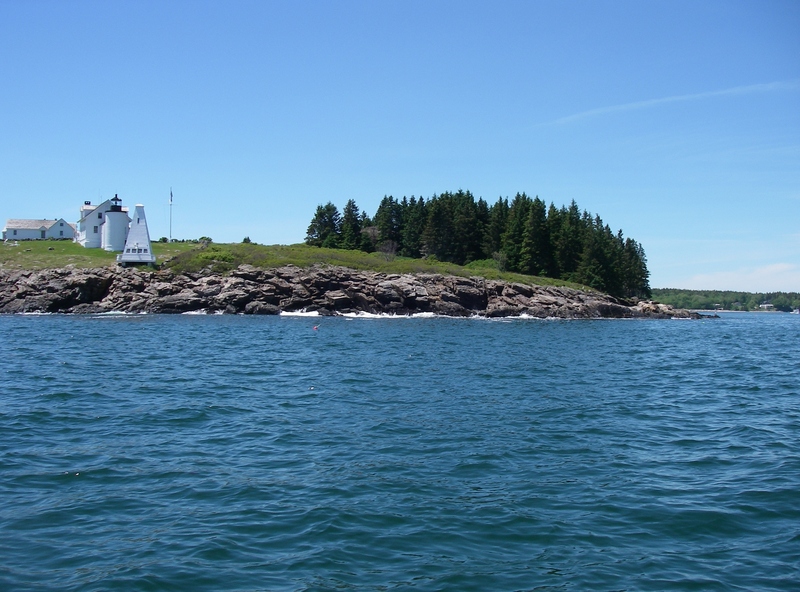 A couple of days later there was another long sailing day around the outside of Cape Ann and up to Portsmouth, New Hampshire, where I met Suzanne for supplies, had some more rest, and waited on the weather. The approaching wind wasn’t as strong as that last rather wild run (no 25’s in the steady-wind forecast! 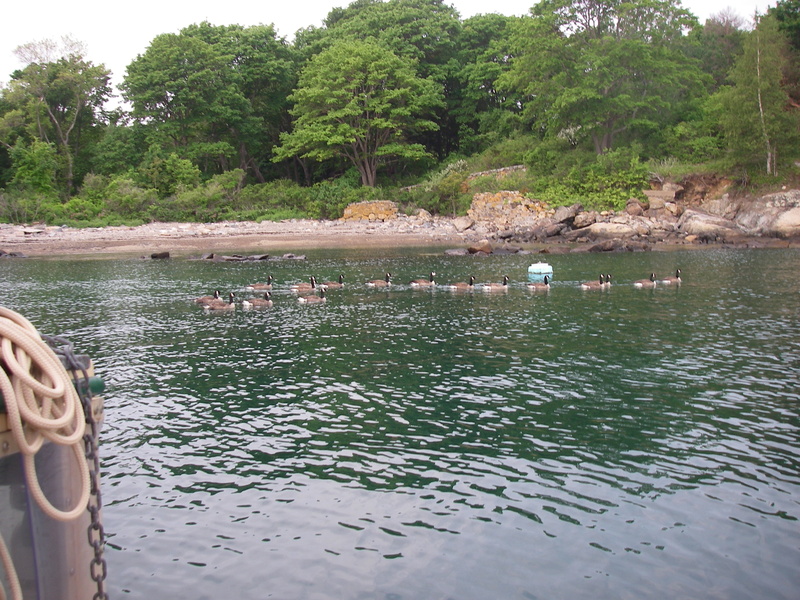 ), and it all seemed like a rather nice idea to head straight for the middle of the Maine coast. First thing Monday morning, off we went. The only downside of avoiding the strong wind is that sometimes, instead, you get no wind at all. The second day out from Portsmouth, about 15 miles south of Damariscove Island, we spent pretty much the whole day floating around in the fog, in roughly the same spot. The Coast Guard even came to visit, having seen us out there for so long, to check that everything was okay. They were happy to know that things were fine, asked if I had a float plan, and somebody on shore keeping track of whether I was arriving as expected, and sounded relieved when I said that yes I did, and that I had a satellite phone, and reported in morning and evening. Off they went, and a couple of hours later, just before dark, the breeze started to come up. The fog disappeared, the boat started moving, and the horizon took on that gorgeous sharp edge that comes with newly clear air and the sun getting low. We sailed through the night, and just before dawn were off of Monhegan Island. There was some more fog, but between the GPS, the compass, and the sounds of the buoys, we found our way, comforted to see the lights on the buoys appear where they were expected, even though the fog hid them until we were pretty close. As the dawn started to barely come up, the wind shifted northwest, and with our goal of Tenants Harbor it was a bit of a slog against the last of the outgoing tide, but very beautiful as the fog again cleared away. There had been quite a bit of rain, in those previous days, and in the dark you could smell the islands, wet evergreens, coming across on the breeze. What a sweet way to arrive home. Now, here I am, moving to Maine – and landed. There’s still a trip from this harbor here in Penobscot Bay over to Gouldsboro, on the far side of Acadia National Park. With some consistent wind this could be done in about three days, with overnight stops in lovely places. Or one could go straight through, perhaps arriving in about 24 hours, if the wind blew just so. For now it’s resting, and visiting, and waiting for the next bit of weather to go by. It’s been a tremendous trip so far, including all those nights at sea, and I’m enormously pleased, by all of it. 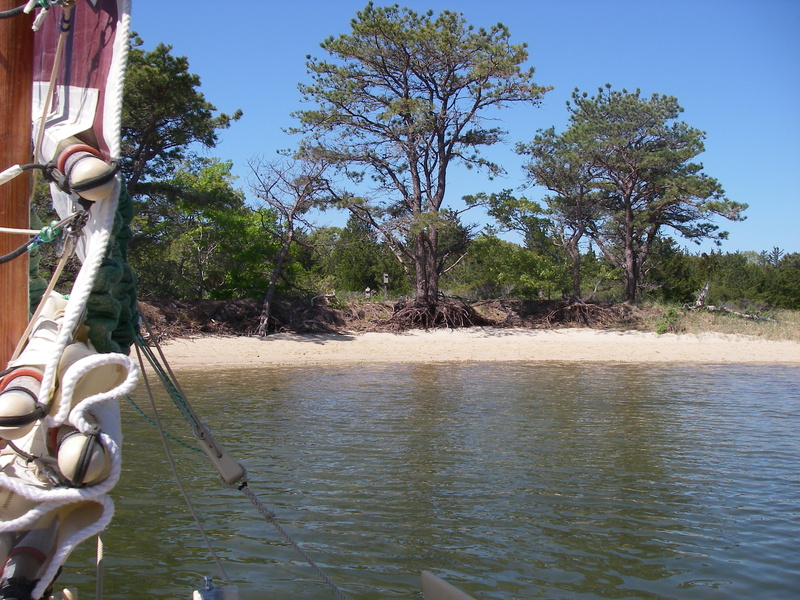 I grew up sailing in Cotuit Harbor and surrounding waters, mainly Popponesset Bay, which may be open to the Sound now, but the great adventure was sailing around the island of Oyster Harbors and going past Osterville. I miss the bathtub warm water and ease of sailing in any tide, but love the energies of the Fundy tides. Thanks for giving me these vicarious adventures! So glad you’re enjoying the adventures! 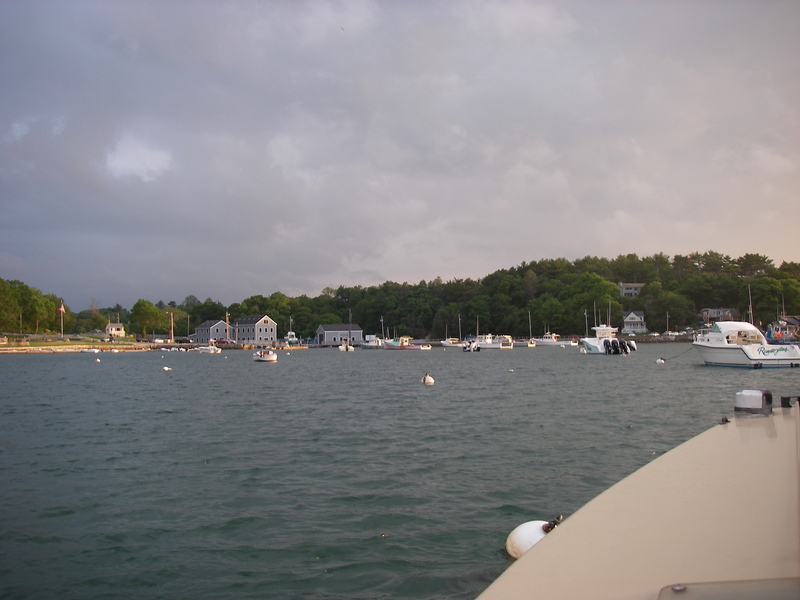 What a beautiful area to have grown up around, Cotuit. Popponesset does appear open to Nantucket sound now, but it’s a very shallow business to get in, and I didn’t try. Though I’d love to see it in there! Shemaya, the pictures are lovely. I especially like the one of the “crew”. So glad that you are having good sails. Very glad you’re enjoying the pictures – the crew were clamoring to be famous, so there they are! Bravo! You’ve certainly been farther off shore than I ever have! And continuous sailing for days and nights on end! I only pray you don’t meet up, while asleep, with the one ship that slips past all your technology, and (of course) isn’t keeping a good watch. Beautiful run! Thanks! I’ve got those same prayers going, about those ships – thanks so much for your good thoughts. Fortunately there aren’t very many of the big ships out and about in the areas I’ve been sailing. No Atlantic approaches to New York harbor for this puppy! Thanks so much! It’s been extraordinary, to do it in this way. Now we’re working on a good, workable dock (or “float” as they call it up here). 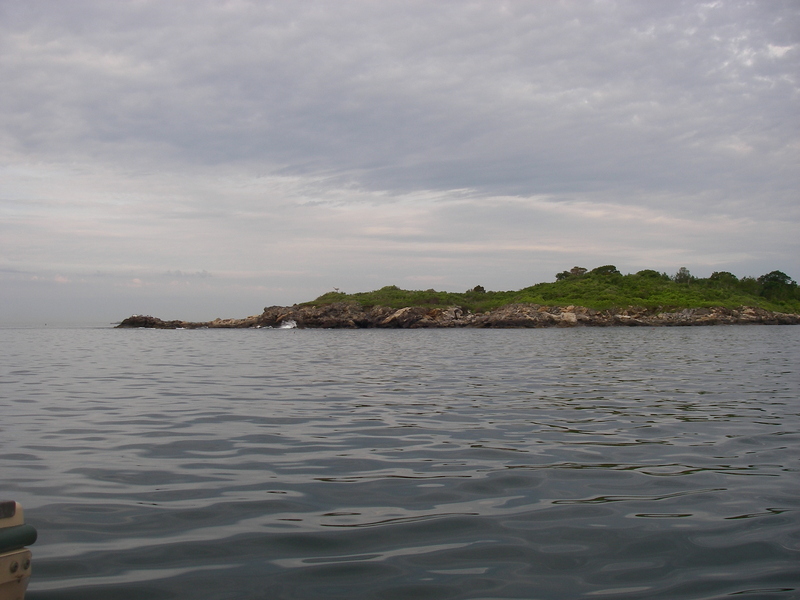 And I’ve been back down from Gouldsboro to Penobscot Bay, while things are getting in order with the house. All the way around, it’s quite an adventure! I recently had a four day sail in light winds with swell from two different directions. I chose the light weather to nurse my new-to-me old Folkboat… like you I ended up feeling ordinar. Thinner too; my pants never fell off but my wife did drive straight by, not recognising me!? 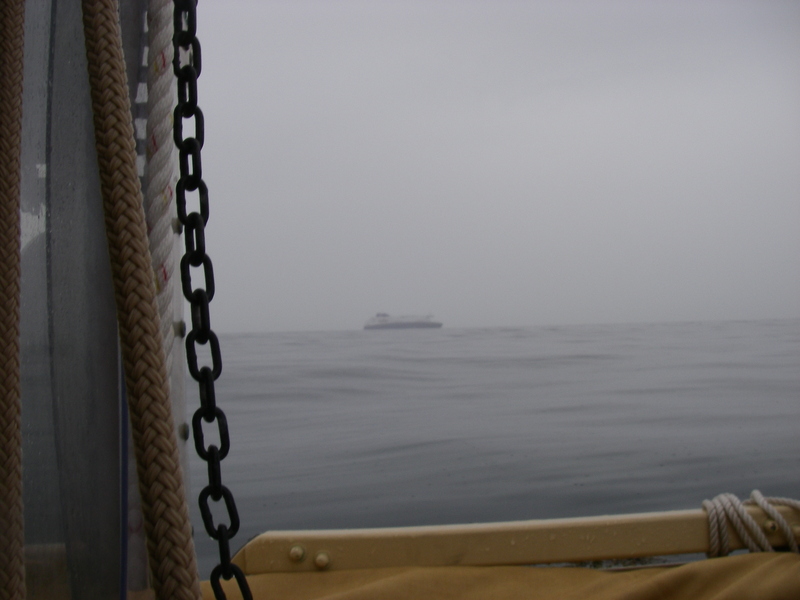 Wonderful how the woozy feelings and fear of stuff at sea passes, and you want to do it all again. Thanks for sharing, I too liked your famous crew. I hope I never grow too old to admire teddy bears. Best Terry.